Xolo A500S was launched earlier this month. The phone packs a dual-core Mediatek. processor clocked at 1.2 GHz. The phone runs on Android 4.2 Jelly Bean OS. The screen is 4 inches making it a compact device to carry around. It has a 5MP camera at the back and VGA Front camera for video calling. It packs in 512MB RAM and 4GB of internal memory which can be expanded to 32GB via microSD. It has most of the common connectivity options. Under the hood is a 1400 mAh battery to keep it running. You can have a look at the Full specifications here. 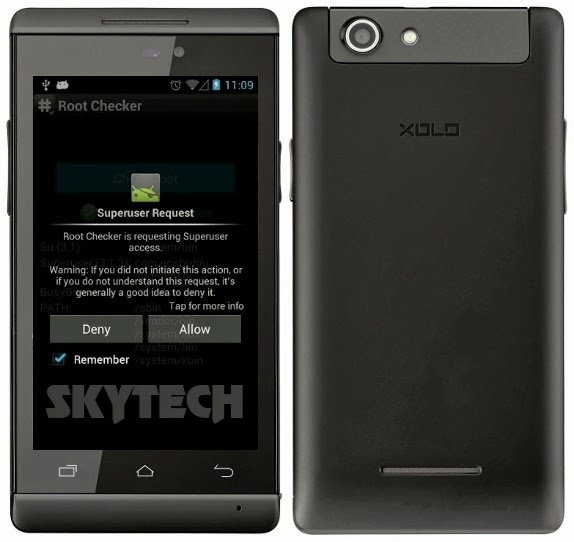 Rooting the Xolo A500S is quite simple and it uses the same method as Micromax Canvas Fun A74 to get root access. 1. Download & Install Framaroot.apk and open it. 3. Then Click on “Boromir”. 4. It Will Display A Root Confirmation Message, Click On “OK” And Then “REBOOT” Your Device. 5. After Reboot You Will Find SuperSu Application In The App Drawer.